Just look at these exciting designs for "Tippy" Toadstool caps and stems! What's more, a patented hidden spring mechanism fits in between caps and stems, so they quiver and jiggle in the slightest puff of wind. 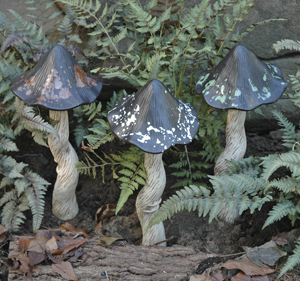 "Tippy" Toadstools come in Large, Medium and Small-and in three color combinations. Richly textured stems are detailed in brown on white. Metal tubes (included) fit into stems, to anchor them into the ground.